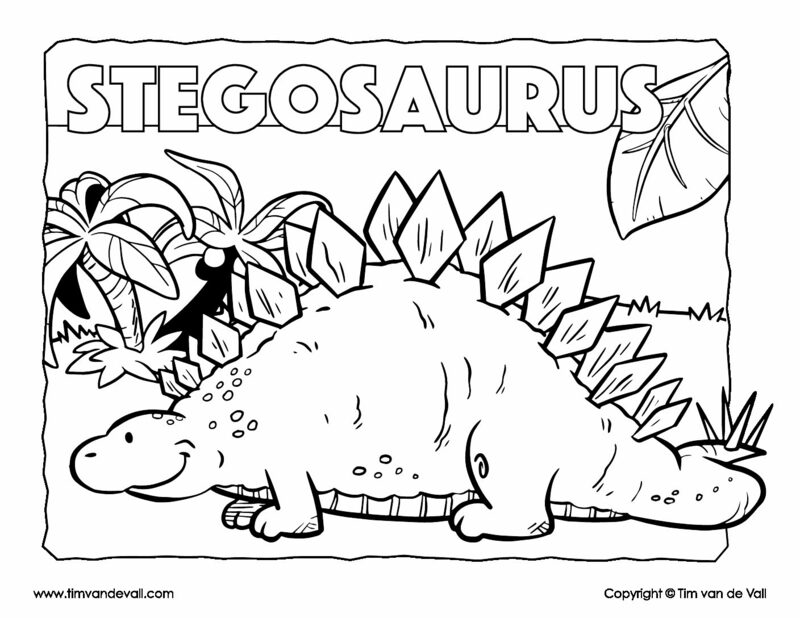 Print a stegosaurus coloring page for your kids! This freebie is perfect for all Dino-loving kiddos. Print it as a fun afternoon activity in the classroom or at home. The stegosaurus was a plant-eating dinosaur that lived between 155 and 150 million years ago, during the late Jurassic. It roamed through what today is the western part of the United States and Portugal. Living alongside stegosaurus at the time were dinosaurs such as brachiosaurus, apatosaurus, and allosaurus. The term “stegosaurus” means “roof lizard” in Greek. On its back grew large kite-shaped plates. Four large spikes protruded from its tail. This dinsosaur was a behemoth, weighing it at anywhere between 5 to 8 tons (about as heavy as one or two Hummers). It could grow up to 9 meters in length. Despite its colossal size, stegosaurus had a brain approximately as large as that of a dog.